In a new job, it’s hard to know what details are important and what you can let slip in one ear and out the other. I’ve been trying to soak up everything – a strategy which has been moderately successful. I’ve picked up a lot of low-level detail and, not yet knowing if it is something that I should be focusing on in this role, have got right into why this particular bit of technology doesn’t work or whether we have sent out this purchase order. I have to say, I’m finding it all very interesting, and a great way to get to know the team, what’s important to them and what the project is all about. But whether it’s a good use of a project manager’s time in the long run remains to be seen. 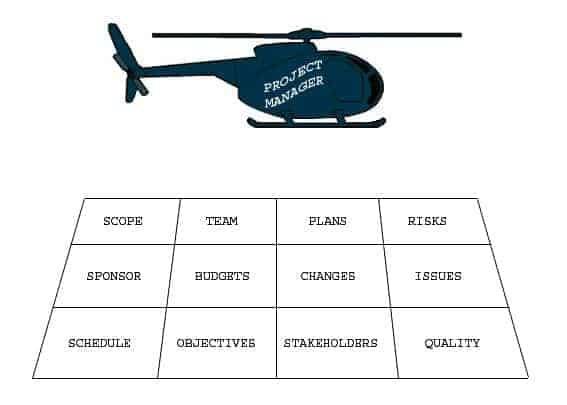 Given the size and scale of the project, I think project managers, myself included, would do better to maintain a strategic view, keep all the plates spinning, and then only focus on individual details when they need us to step in and help resolve something. Keep your sponsor close: it’s not just you at risk of losing focus. It’s easy for the sponsor to lose sight of what they originally wanted to achieve with the project and change it beyond recognition – at which point you should be flagging this up to other stakeholders or your manager, if your sponsor has stopped listening to your concerns. In your communications with your sponsor always try to answer the question: how does this help us achieve our objectives? Think of your role as a helicopter. You need to have an overall view of all the activities that make up your project: scope, quality control, the schedule, your team and so on, to be able to zoom in and deal with any crisis in any area. But you also need to be able to pull back, hover and see how the whole picture looks together. When you start a new project you are going to have to learn what’s important and what’s not. Then you’ll be able to ‘land’ on a problem and resolve it while still seeing the big picture. My own personal helicopter to help me avoid London’s crowded public transport system wouldn’t go amiss either. * This helicopter graphic is taken from my book . Hi Elizabeth. I read this after your summary of the last 4.5 years. It was a great one to pop into your list of “old posts”! This is an enjoyable analogy that explains the role of a PM in terms of being able to see the big picture very well. Thanks for sharing – the point is well made. Glad you enjoyed it! That image is from my book, Project Management in the Real World, and it was fun to put together and talk to the editor about!